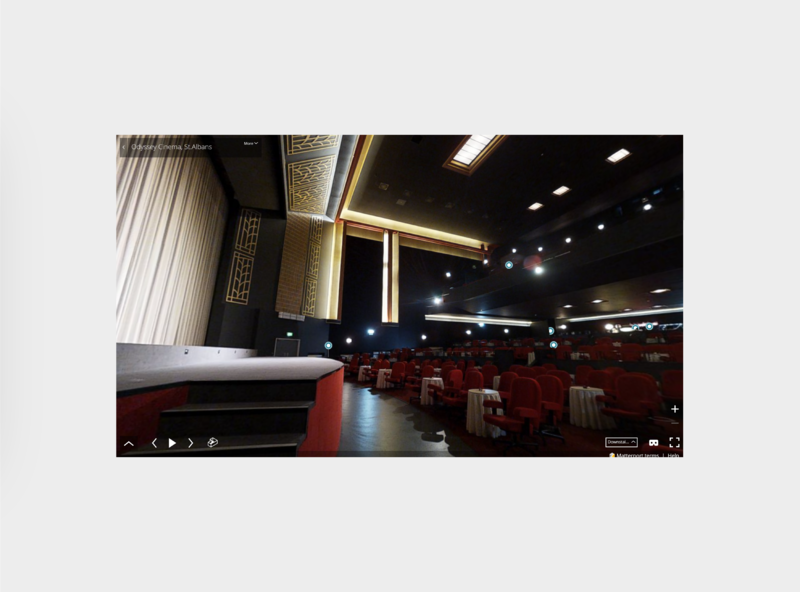 Matterport 360/3D tour, Odyssey Cinema, St. Albans. 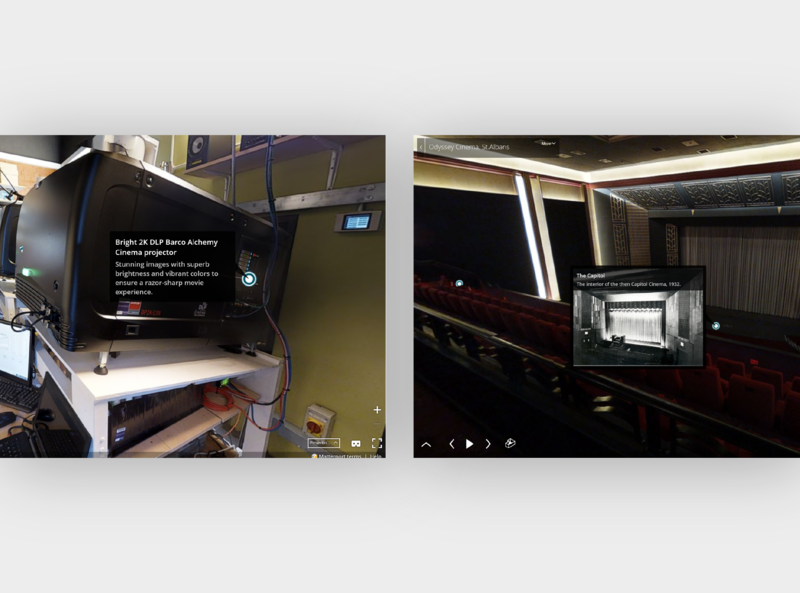 Using the Matterport system, we created a 3D/360 Virtual tour, embeddable online, and shareable via Social Media platforms, driving awareness, customer engagement and sales. The Matterport system, uses an infrared scanner to create a point to point model of the environment, the user can also view the experience as a 3D ‘Dollhouse’ model, or a top down floor plan view. Each floor can be individually isolated for viewing specific areas. The point to point system, creates a seamless viewing experience, transitioning smoothly from point to point, utilising high quality, stereoscopic imagery. Unlike other Virtual Tours on the market, Matterport can also be viewed in a VR headset such as Google Cardboard, or Samsung Gear VR, providing a truly immersive experience. We used first person view inside the main cinema screening room, to scan each individual row of seating, enabling potential customers to see an accurate view from each seating arrangement. We utilised the historic importance and rich history of the cinema, to provide an immersive experience through modern technology. Manual controls are available to control different aspects of the experience. A left/right control to move automatically between scenes, the dollhouse view button, floor filter, share link, fullscreen and zoom function for close-up view on details. Integration of information contains details of a ‘mattertag’ an embeddable hotspot within the experience. 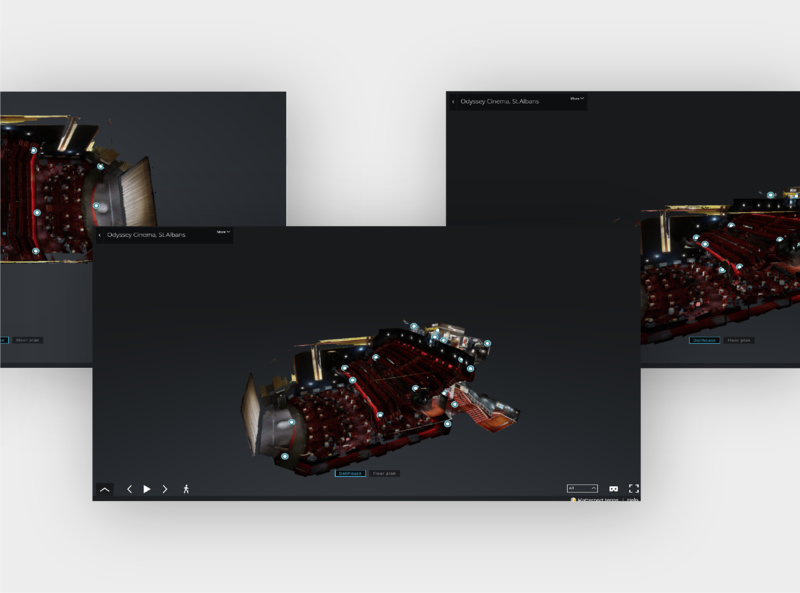 This allowed us to integrate text, an image, or hyperlinked video to provide an immersive and informative experience and was indispensable when detailing key areas, bringing up detailed high quality images or video on an area of special interest. Since release of the virtual experience, the Odyssey Cinema has experienced a higher turnover of consumers engaging with both the cinema, and through social media.